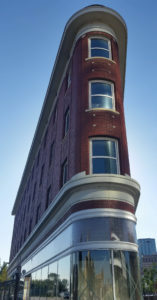 The iconic Gibson Block hosted retail space and offices, as well as the Edmonton Steam Baths—a “Turkish bath” in the basement that operated until 1978. It now houses the Women’s Emergency Accommodation Shelter. Its 1994 restoration by E4C represents the kind of partnership between heritage and social services that has been a powerful tool in many communities to preserve heritage buildings.